SEQUIM, Wash. — The Hood Canal floating bridge was closed for repairs for six weeks beginning May 1. It left travelers seeking to get off the Olympic Peninsula the option of a long drive on narrow, twisting Highway 101 down the 55-mile fiord to Olympia. 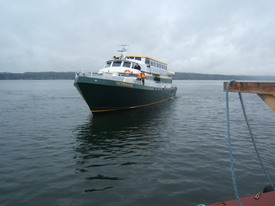 The other option was a ride on a passengers-only ferry across Hood Canal where travelers boarded transit buses that carried them down through Poulsbo and the Suquamish Indian Reservation to the ferry on Bainbridge Island for the crossing to Seattle. My choice was the foot-passenger ferry. Twice I took this trip and found that entrusting myself to Clallam Transit and Kitsap Transit bus drivers and the captains of these little foot-passenger ferries was as much fun as getting there. I was not alone. The parking lots on both sides of Hood Canal were soon packed with cars and hundreds, if not thousands, were riding the ferries and buses too and from Seattle. My first expedition was a few weeks ago when I traveled to Seattle to meet Roberta Wood, my colleague and comrade, to help in some fundraising for the PWW. My wife Joyce drove me down to Southpoint where I caught the ferry across to Lofall, boarded the bus to Bainbridge Island. I got to Seattle so early I spent three hours waiting for Roberta to pick me up at Ivar’s “Acres of Clams” open-air restaurant. We traveled back up to the Peninsula together the next day. As we were arriving at the Lofall ferry, I checked the Clallam Transit bus schedule. “I think we’re too late,” I told Roberta. “The last shuttle to Sequim is 6:30. We’ll miss it by about ten minutes. I’ll have to call Joyce and ask her to come pick us up.” It meant a 40-minute drive for Joyce, 80 miles round-trip. When we reached the other side twenty minutes later, a bus driver was standing at the gate. “I’ve been waiting for you,” he said when he spotted us. So Roberta and I rode in style from Southpoint to Sequim. Her trip up to the Peninsula was a great success in other ways too. She raised a couple of thousand dollars for the PWW. The ferry and Clallam Transit trip were free. My second expedition to Seattle I was accompanied by my niece Erika Hamerquist and a young friend, Dan Burdick, to attend the May 30 march for healthcare in Seattle. We drove together down to Southpoint and rode the ferry across to Lofall. This time I had my notebook and camera to record the comments of fellow passengers. Gary Gleason, a retired science teacher at Port Angeles High School told me he was traveling to Seattle for a matinee performance of the Pacific Northwest Ballet. “I scouted out this trip two weeks ago. It’s great. People are really trying hard to make this work right.” He recalled the Lincoln Birthday storm Feb. 13, 1979, that sank the Hood Canal floating bridge. It did not reopen until October 1982. He spotted my “Healthcare First” lapel button. He said he is a member of the Washington State School Retirees Association legislative committee. “I’m down in Olympia frequently working on health care legislation. It’s a very urgent need,” he said. Ken Hagerman and his wife were on their way down to Suquamish to help their daughter and son-in-law move to Port Orchard. “It is taking about two hours to go what I usually do in five minutes,” he said with a chuckle. He too spotted my lapel button. “Do you think we’ll get single-payer health care?” he asked. “I am retired and they have increased my co-pays and deductibles six times,” he said. We arrived in Seattle and took the bus to Pratt Park, arriving two hours early for the health care rally and march. Later that afternoon we reversed the process arriving back home in Sequim at about 8:20 p.m. The repairs are nearly complete and the bridge is scheduled to reopen June 5 or 6. I will miss the enforced isolation of having that bridge closed. It reminds me of my youth when we had to take multiple ferries and long drives on narrow twisting roads to get on and off the Peninsula. Maybe we were getting a glimpse of a “greener” future when people will leave their cars at home and travel great distances by bus, rail, and ferry to get where they want to be, chatting and joking with fellow-travelers all the way.